What inspired you to write CROWN OF ICE? I was on Twitter one day when I saw some agents and writers chatting about interesting concepts, one of which was re-telling fairytales or folktales from the villain’s point of view. This intrigued me. I needed a new story concept, and I wanted to try my hand at writing Young Adult Fantasy. As I contemplated this idea, one of my favorite literary fairytales popped into my head—Hans Christian Andersen’s “The Snow Queen”. I considered how to tell a story from the POV of the Snow Queen. In Andersen’s tale, she’s more a force of nature than a fully developed character, so I knew I had to find another way to depict her if I wanted to build a book around her. What came to me was the idea of a young person who has beaten all the odds in order to survive. So, using a bit of my own experiences with severe depression (and fighting my way back from that), I developed a story around the idea of a girl who was once been warm and sensitive, but has been forced by life and circumstances to “freeze” her heart and emotions in order to survive. What would it take for this person to come back to life, to truly feel again? Could she overcome her survival mechanisms and learn to care, to love? The whole idea of freezing, of ice, of survival against the odds, of intellect vs emotions tied-in so beautifully with Andersen’s concepts in “The Snow Queen” that I knew I’d found the perfect match of inspiration and story. How did you decide which fairytales to focus on in your series? I wanted to stay with Hans Christian Andersen stories, because that fit the world I’d created for CROWN OF ICE, so I read through his tales again to see what I thought might work for the companion books. I knew I wanted to tell the story of one of Gerda’s sisters (who were only mentioned in CROWN) and also bring in aspects of a war-torn country. The historical period that influenced the Snow Queen Saga is the early to mid-1800s (to fit with Andersen’s own depictions of life in his fairytales). This led me to think about the Napoleonic Wars and how such wide-scale invasions and far-flung battles might affect small villages and cities in (basically) a Scandinavian landscape. So I decided to merge two of Andersen’s tales for SCEPTER OF FIRE: The Steadfast Tin Soldier and The Ugly Duckling. The book includes two young soldiers as main characters as well as a protagonist, Varna Lund, who is a very plain and considered the “ugly duckling” in her family. For the third book in the series, ORB OF LIGHT, I wanted to bring in a very different type of protagonist – someone not from a European-type country – to interact with many of the characters from CROWN and SCEPTER. I considered several different Andersen tales, and finally settled on “The Little Match Girl” because my protagonist, who doesn’t know her origins, is able to create illusions from any source of light. Is there anything you find particularly challenging in writing fairytale retellings? I think one of the trickier things is to try to retain some of the flavor of the original stories through the writing style. I know such a style might not be every reader’s cup of tea, but it is a deliberate choice, partially to honor the original author. How did you come up with the title for CROWN OF ICE? Actually, another author came up with the title. I met her through my interactions with other writers on the Agent Query Connect site. (A great site for writers, by the way -- http://agentqueryconnect.com/ ). 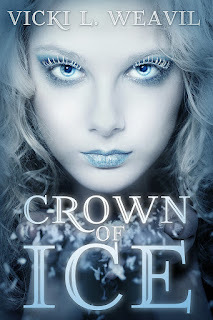 I’d asked for help and this author provided several ideas, including CROWN OF ICE, which I loved. By the way, her name was Joey Francisco and she was on the verge of achieving her own writing dreams when she tragically died after a short and unexpected illness. I would’ve used the title anyway, but now it also stands as a tribute to Joey. Did you draw on any other fairy tale characters when creating Thyra? No, not really. My real inspiration for Thyra came from the many young people (and adults) who are survivors. Those who endure illness, injury, abuse, mental illness, social stigmas, war, or any other major life challenges can often be forced to “shut down” or “freeze” their emotions in order to survive. This is actually a mechanism that shows strength, since they are fighters and survivors. But it can also cause long-term difficulties with social interaction and relationships. It’s really a double-edged sword. Thank you so much for your time Vicki and I cannot wait for SCEPTOR OF FIRE in 2016! 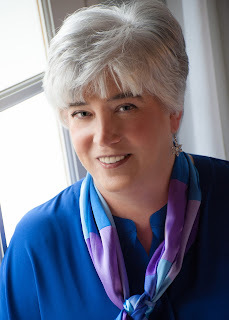 If there’s one word to describe author and librarian, Vicki L. Weavil, it’s “eclectic.” Equally enchanted by classical music and current chart-toppers, and appreciative of pop culture as well as high art, Vicki loves good writing in all genres. A lifelong fan of fantasy and science fiction, Vicki also enjoys a twisty mystery or mind-expanding literary fiction. Vicki’s debut novel, CROWN OF ICE—a dark YA retelling of H. C. Andersen’s “The Snow Queen”—was published by Month9Books in 2014. Her YA scifi, FACSIMILE will be released in Feb. 2016. Vicki has also completed the first two books in an adult scifi trilogy involving art, dreams, and aliens. The third book is one of her many works-in-progress. Vicki is also currently writing more YA Fantasy novels, including two companion novels to CROWN OF ICE. Coffee, cats, and chocolate are basic essentials in Vicki’s life. She loves foreign films, but will defend the merit of television shows like BATTLESTAR GALACTICA and FRINGE against all naysayers. She’d be happy to travel the world, if someone would just provide the ticket.